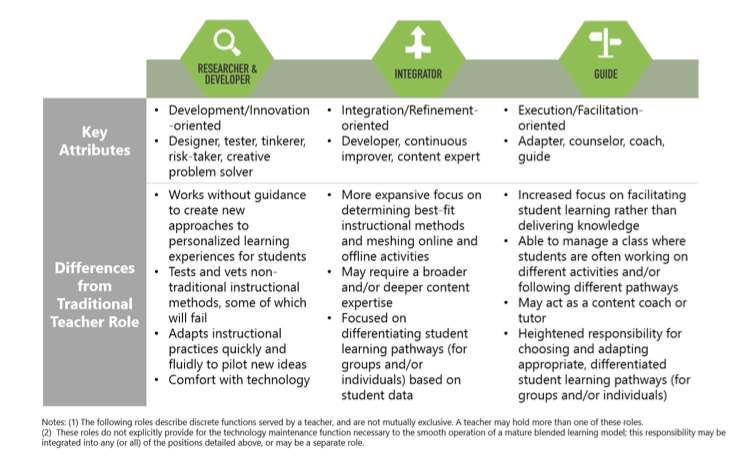 BPL Tech Space: How Should Blended Learning Schools be Hiring and Training Teachers? How Should Blended Learning Schools be Hiring and Training Teachers? A recent working paper paper by the Teaching New Teachers Project provides some real insight on how the role of the teacher is changing as we move toward a more universal acceptance of individualized and blending learning. While this paper may be short on addressing a concern of blended learning critics that there is no consistency on how to measure student learning, it offers insight on how the development and hiring of teachers should be shifted. Of particular note, new teachers should have the capacity to be Researchers, Integrators and Guides. What are the skills that you think next-generation teachers need to help them provide an engaging and personalized education model for their students? That's a very cool educational course. I'm wondering how to implement it in my course of English. I'm a teacher and i find it really modern, exciting and relevant enough. When i found out that my children use english homework helper i was very upset. And started to think how to upgrade my methods. Thank you fot you work!